Compare all lifts We Can Help! 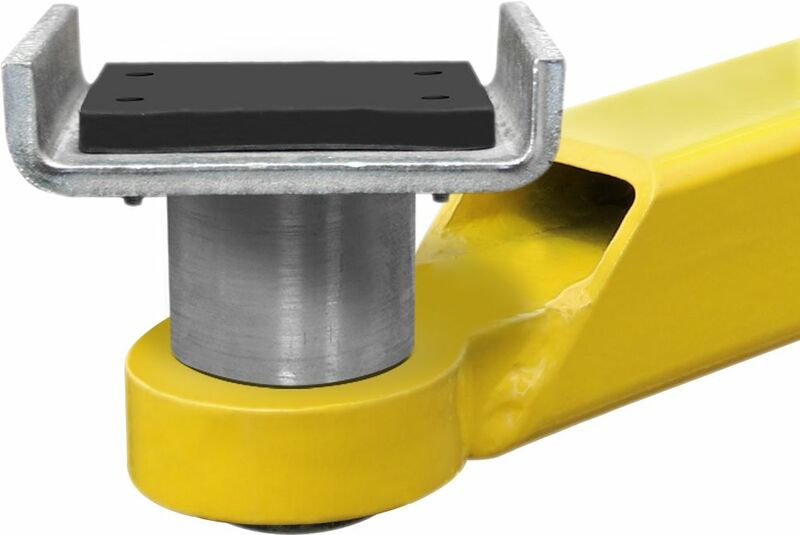 ​Our rugged two-post lifts are designed to handle all of your auto lifting applications. 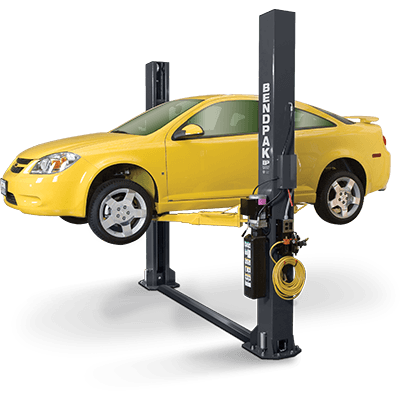 BendPak models service up to 18,000 lbs. We know you demand uncompromising quality from productive machines that maximize lift time and get the job done safely. That's why our rugged two-post lifts deliver on our promise of superior performance. It's what BendPak clients have come to expect from our equipment. Our two-post lifts are respected all around the world for their top-notch craftsmanship, forward-looking technology and feature-rich designs. 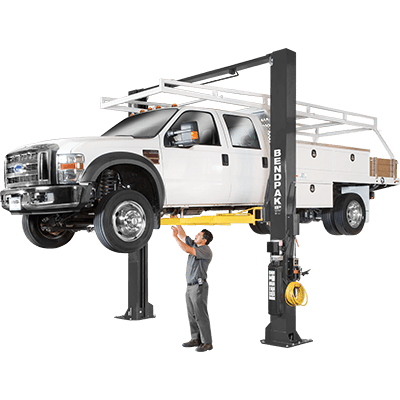 Automotive service pros have been raving about our auto lifts for years. If this is your first BendPak purchase, you're about to find out what sets us above the rest. The GP-7LCS is a truly one-of-a-kind design. Because it fits in garages with ceilings as low as 9', it boasts the lowest columns ever found on a permanent two-post lift. It can be installed in virtually every garage on the planet and still offers an impressive 58" rise. The GP-7LC is a shortened version of the standard GP-7, accommodating ceilings as low as 10' while offering an impressive 68" max rise. This model is truly designed for homeowners who until now could never fit a two-post lift in their garage. 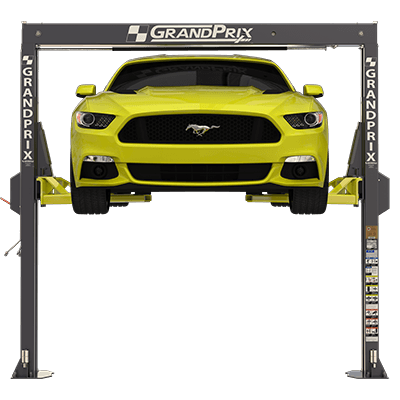 Our standard-height GP-7 is fit for garages with 13' ceilings and offers a full 78" max rise. These dimensions are similar to other two-post lifts, but the GP-7 offers a much slimmer profile than other lifts. This makes it ideal for narrow garages looking to fit more lifts in limited space. The XPR-9S two-post lift offers automotive service professionals unparalleled lifting performance and lasting quality. State-of-the-art technology, top-notch materials, a forward-looking design and a 9,000-lb. lifting capacity make this lift a fantastic purchase. The XPR-10S two-post lift offers exceptional direct-drive lifting performance. This industrial-strength car lift guarantees cutting-edge technology, top of the line materials, a design that's ahead of its time and a 10,000-lb. lifting capacity. The XPR-10AXLS model adds 6” of lift and extends the overall height by 6”. Taller people know that the difference between stooping and standing under a two-post lift can be the difference between severe back/neck pain and working in total comfort. Every XPR-12CL two-post lift is designed to keep your floor clean. Our Clearfloor design offers enough space for cars and trucks up to 12,000 lbs. Pure Direct-Drive performance is matched by cutting-edge technology and top-of-the-line materials. 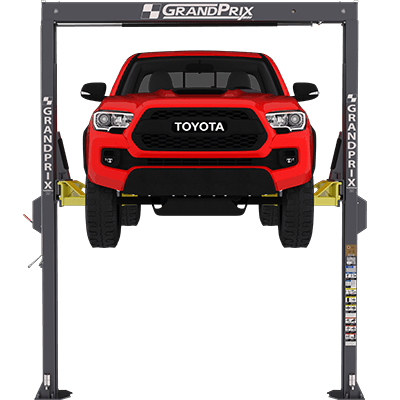 The XPR-15CL two-post car lift offers 15,000 lbs. of lifting power. 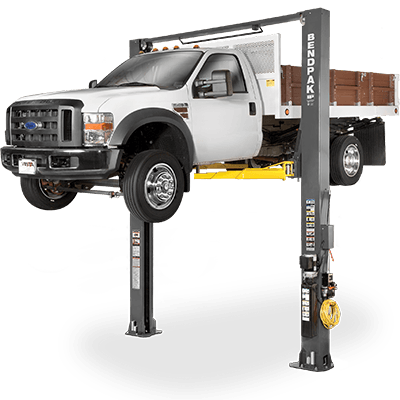 Not only does this lift let you operate on low-profile cars, it has the ability to lift some extremely heavy trucks and vans. 15,000 lbs. is enough to lift a dump truck, so you’re covered on most lifting applications. 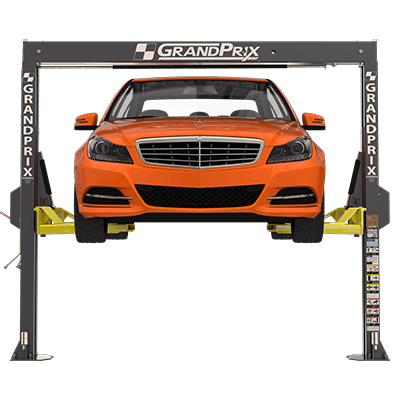 Shops that work on massive fleets and vehicles need a powerful car lift with a small footprint. BendPak’s 18,000-lb. capacity XPR-18CL offers the most extraordinary lifting capacity of any two-post lift we make, which means you get the best column, carriage and frame component construction we offer. 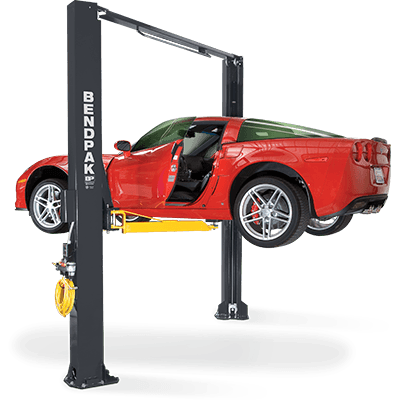 No matter the capacity of the model you choose, BendPak has an ALI Certified car lift for you. Our lighter-duty 9,000-lb. and 10,000-lb. capacity lifts cater to vehicles of all shapes and sizes. Telescoping swing-arms are tailor-made for either symmetric or asymmetric design. We also make low-profile arms to lift sports cars and other low-stance vehicles. For those who need higher-capacity car and truck lifts, as covered by our 12,000-lb. and 15,000-lb. models, you get the same certified structure and components, as well as those all-importantetl, fully adjustable swing-arms. And last but never least, our 18,000-lb. two-post lift is a true beast of a machine. As our highest-capacity model, it strikes fear in the heart of competitors who can't match our safety standards and incredible value, and it ensures you can safely lift just about anything that comes your way. Even if you see another brand with a lift rated for the same weight capacity, think twice before assuming it's as reliable and well-made as a BendPak. Other companies skimp on safety and performance. BendPak sets the benchmark for quality. Lift capacity is only one thing to consider when buying a lift. 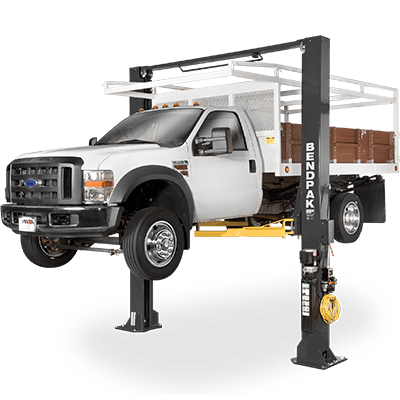 BendPak offers increased reliability and versatility, in addition to impressive lifting capacity. Each lift comes in a variety of widths and heights. Our Clearfloor two-post car lift models (e.g., XPR-15CL, XPR-18CL) provide unobstructed floor space. 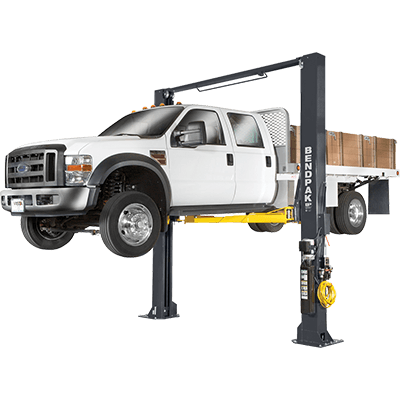 This design makes it easy for technicians to move toolboxes, transmission jacks, oil drains and other automotive equipment under the elevated vehicle. 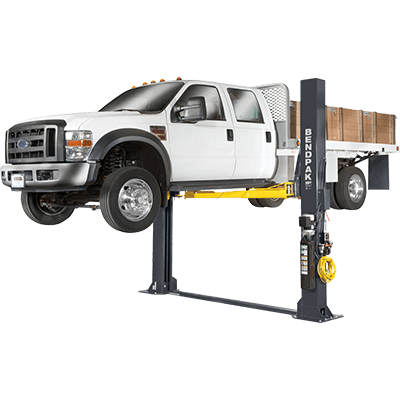 However, if you have a low ceiling or find yourself lifting high-profile trucks and vans, you may want to opt for a floorplate two-post lift model. These are made without overhead obstructions, which increases headroom. You may even want to open a vehicle's doors while it's still on the car lift. In that case, you'll definitely want to check out an asymmetric car lift. 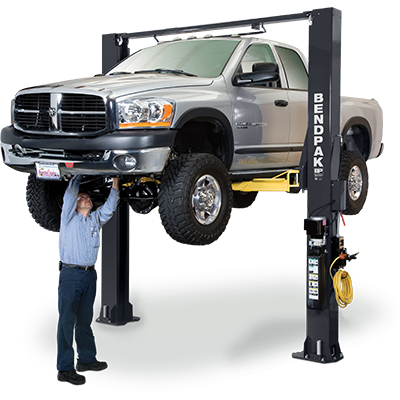 No matter your auto equipment needs, BendPak has a high-capacity two-post lift ready to ship and install to your garage. Many of our lifts are ALI Certified, so ask us if you aren't sure. Note that weight capacity has nothing to do with whether or not a vehicle lift is certified. From the hydraulics design to the quality of the lift carriage; from the telescoping arms to the single-piece column construction, BendPak never, ever skimps on quality. 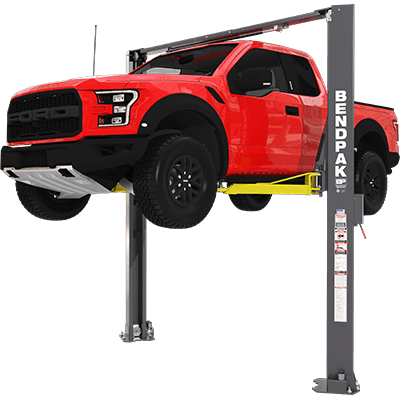 BendPak lifts are supplied with installation instructions and concrete fasteners meeting the criteria as prescribed by the American National Standard "Automotive Lifts - Safety Requirements for Construction, Testing, and Validation" ANSI/ALI ALCTV-201​7. Car lift buyers are responsible for any special regional structural and/or seismic anchoring requirements specified by any other agencies and/or codes such as the Uniform Building Code (UBC) and/or International Building Code (IBC).